I admit it, I love cereal. At any given time you can generally find at least three different types of cereal in my pantry. You see, I can’t eat just one variety, I have to have at least two different ones in my bowl. It is a habit leftover from college where I would go down the line and mix and match all kinds of cereals. The cereals I choose now are generally whole grain, higher in fiber, and lower in sugar (don’t single out ingredients like high fructose corn syrup or evaporated cane juice – just be sure to check for total sugars.) I also pair it with low fat milk and fresh fruit so that I can stay full longer. As much as I love to eat cereal, I also like to cook with it. It is a great way to add crunch, some fiber or a bit of sweetness to a dish. 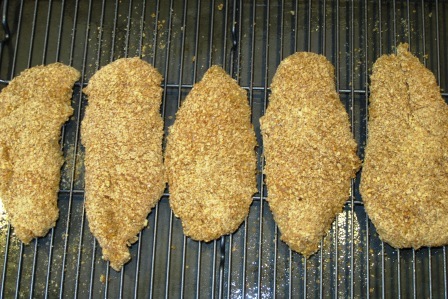 Recently I bought two different All-Bran cereals (Complete Wheat and Original) to experiment with making my own version of oven “fried” chicken. 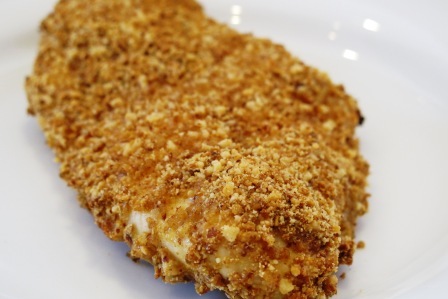 The All-Bran Complete Wheat Flakes were the perfect alternative to corn flakes, adding more fiber and an interesting depth of flavor to the chicken, especially combined with almonds and parmesan cheese. The result was a very crunchy exterior and super moist inside. My husband was amazed at how well it turned out. I was amazed at how simple it was. 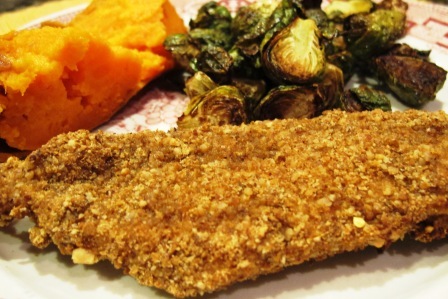 This quick and easy dinner recipe would also make great nuggets or fish sticks. It’s also a very kid friendly recipe. My son ate it two days in a row, which is high praise from a child who generally turns up his nose to any type of leftover. 1. Preheat oven to 425 degrees F. Place an oven-safe wire rack in a sheet-pan and coat well with cooking spray. 2. 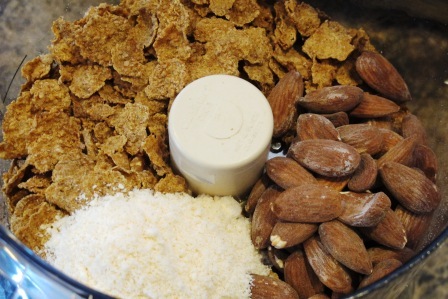 Place flakes, almonds and cheese in the bowl of a food processor. Process until well combined and ground finely. Put in a shallow dish. 3. Place lightly beaten egg in a separate shallow dish. 4. 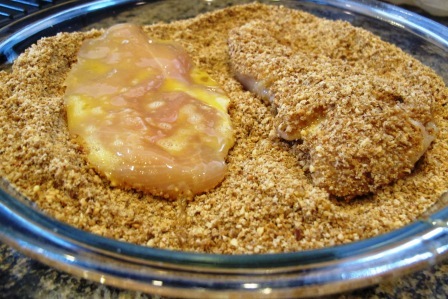 Dredge chicken breasts in the egg, coating well on both sides. 5. 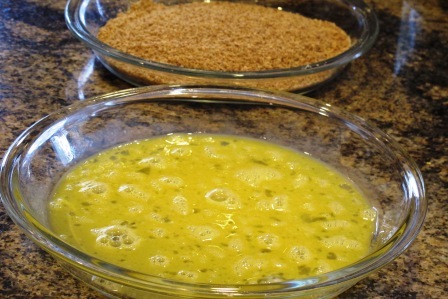 Then place in the crumb mixture, coating well on both sides. 6. 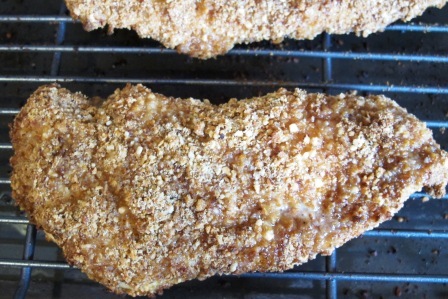 Place breaded chicken on wire rack on sheet pan. 7. Bake about 15 minutes in oven or until internal temperature reaches 165 degree F.
As I mentioned, I bought two All-Bran cereals for experimenting and the other was the Original. I immediately thought of haystacks when trying to decide what else I could do with it. I do have a bit of a sweet tooth from time to time that I indulge with a small portion of something rich and wonderful. I find it is better to have a small portion of the real thing than eating something that doesn’t quite satisfy what you really are wanting. 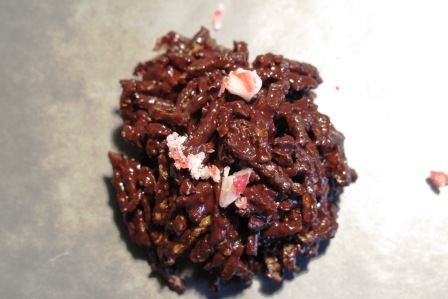 Lately, chocolate has been a craving, so why not make a Dark Chocolate Peppermint Haystack in keeping with the season. The All-Bran Original was the perfect “hay” for my stacks with the right amount of crunch and subtle sweetness. The fact that it is high in fiber is a bonus in my opinion, especially since I’ve never really liked chow mein noodles, which are traditionally used in the dessert. Using a high-fiber cereal helped turn the hay stacks into a healthier dessert recipe that was still kid friendly. 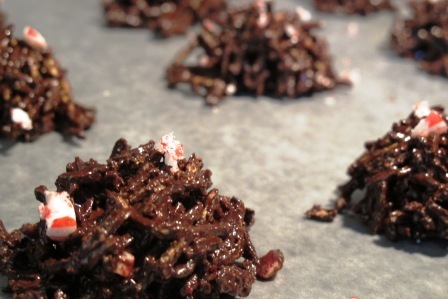 I did include some semi-sweet chocolate chips in the recipe to add a little sweetness to the dark chocolate, which in its pure form may be bitter to some (especially to a few of my family members). Everyone loved it, and even my non-chocolate-eating son (strange family gene that skipped my generation) gobbled up. Spray a medium size microwaveable glass bowl with cooking spray. Place dark chocolate and chocolate chips in bowl. Microwave in 30 second intervals, stirring often, until melted. Carefully stir cereal and crushed candy cane into chocolate, being careful not to break it up too much, until it is thoroughly combined. 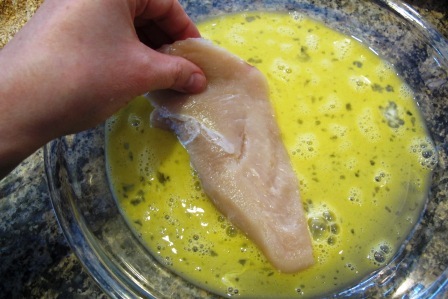 Using a tablespoon measure, scoop mixture onto a wax paper lined sheet pan. Garnish with additional crushed candy cane if desired. Allow to sit for at least 20 minutes for haystacks to harden. Disclaimer: I am a consultant to the Corn Refiners Association (CRA); however, all statements and opinions are my own.